There is something special about beginning a new year. A clean slate. A new chapter. The end of one year and the hope of a better year. However you look at it, it is an exciting time! Having a planner is one thing that makes me feel like I am a step ahead in life. 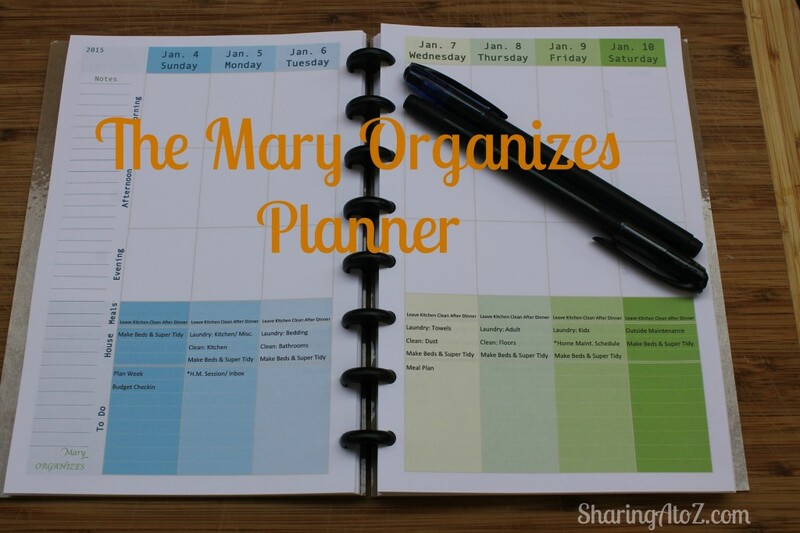 I have tried many planners and I am so excited to use the planner from Mary Organizes for 2015. Mary has a very popular organizing blog. She is a very successful professional organizer. She is a mother, wife and is a wonderful Shaklee leader! I am so excited that she created this planner to help you (and me) organize life! There are so many wonderful things included in this aesthetically pleasing and functional planner! I love to have the option to look at my whole month and also my tasks for the week and day. This planner gives me all three options. It also has a section that lists numerous home maintenance tasks with helpful timelines! She has several options to create a planner that will work best for you. Please check out her store and website for her wonderful planners and organizing tips! This entry was posted in Home, Life and tagged Mary Organizes, planner.